I will be saying very many words before I get to your presents. I apologize for this in advance and ask for your patience. This morning I walked to Poet’s Park in Xian. I am of the family of poets, and many of my ancestors are Chinese. I arrived before sunrise from the north. I entered through the Small Goose Pagoda. The park was already filled with people doing Tai Chi, some of them dressed for work, their briefcases and shoes beside them in a row. I sat in each of the poets’ gardens until I became aware of some detail their poetry taught me to notice. I knew the work of three of the poets: Wang Wei, Li Bai, and Du Fu. Li Bai is known as Li Po in the west. 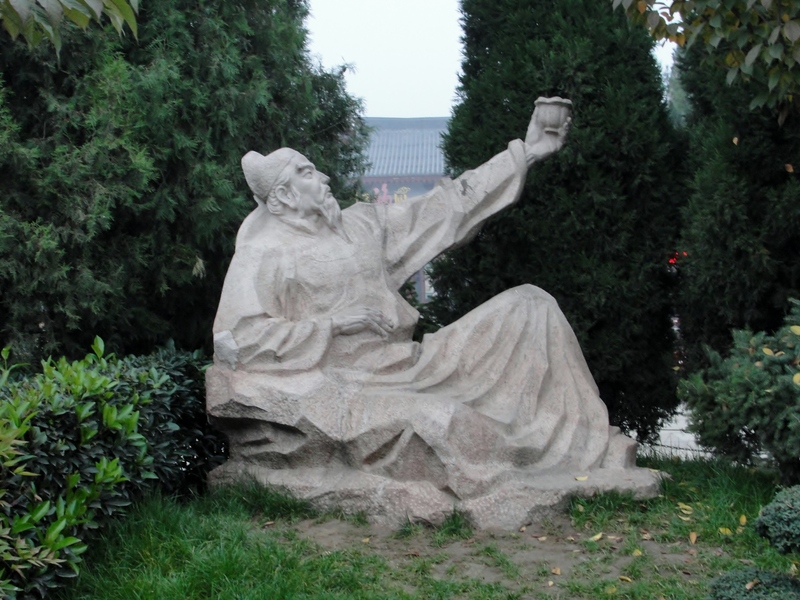 There was one poet, however, who was new to me; Bai Juyi, but they had an English translation of a single line of one of his poems carved in granite in front of his statue. I did not know if Bai Juyi was acknowledged as a great poet in his lifetime or not, but I have studied poetry for many decades, and I did not recognize his name. And he was such a great poet that he is still considered one of the four great Chinese poets in its 2000-year-long tradition. And I thought about Bai Juyi, the man. I learned today that he was known for most of his life as a successful bureaucrat until he retired and began writing poetry. Did he imagine that one day he would be known for his poetry? Would he be surprised if I told him that schoolchildren would be memorizing his poetry and an American poet would be talking about him to a farmer’s family 1200 years in the future? And if I told him he was remembered for a single line of poetry, would he even know which one? That was what I was noticing, after reading that one line from Bai Juyi. So, now, the presents. Poets recognize each other because we are always writing. We are writing in the park, we are writing on the bus, we are writing in our heads when we have no pen or paper. I see us sitting on museum benches, not looking at the paintings at all, but writing until we run out of things to say. Sometimes I want to walk up to one of those writers and introduce myself and say, I see you writing in a notebook, I write in a notebook too. One time I walked up to a girl who was writing in a notebook and I stood behind her and looked over her shoulder, and she was sketching bits of paintings, and writing notes in wild handwriting in the white space around them. For me it’s all about the experience, putting it into words. The only necessities for a poet—except the truly great ones, like Rumi and Milarepa and Li Po, who mostly spoke their poems—are a surface to write on and something to write with. This is what I carry everywhere I go, along with my wallet and watch: a pocket notebook and a pen. I write what I catch myself thinking, whatever catches my eye, anything out of the ordinary, anything that stops my thinking for a moment. I try to describe whatever it was that caught my attention without thinking about it too much. Sometimes what moves me seems not to be related to the outside world at all, and sometimes it’s just watching words form like clouds in my head, and I write them down without thinking and consider them later. It’s easy for me to write when I am feeling something but if I’m not feeling what I’m writing, or if I try to recall it later, I can never get the voice right. It’s easy for me to write down what I am noticing at the time, especially when I’m not certain what it means, but almost impossible to reconstruct it later. Every moment of my life that I haven’t written down has almost completely disappeared or has been changed by my memory beyond recognition. Each of these notebooks is a different color and the pages are the same color. Inside there’s a sleeve for a pen or a pencil. I have already given Xi a purple set, because that is her favorite color. Mine is black. You can choose any color you like. I hope you will use this gift to catch even one joyful moment of your life in words. And that you come across it one day when you are feeling the melancholy of life. Or maybe you will put your sad story into words. One can never tell what will happen when one begins writing. What I’ve written when I’ve been genuinely happy helps me to remember the good in life when I am swallowed by melancholy. And when I am writing about sadness, I can accept it a little better when I have put it into words. And when I am dead I will leave behind my life in a handful of books. Or maybe it will be otherwise for you. Maybe you will write only for the pleasure of writing—of putting your feelings into words. Maybe instead of painting a scene in words you will draw one. Maybe you will write songs, take notes from your reading, collect your dreams, design a garden, interview the mayor. Maybe you will find no use for it at all. But tonight I will be smiling as I write down today’s memories, enjoying them a second time, celebrating and preserving and mourning my life as it passes. I want to remember the minutiae of life, what’s alive in it. Like this ceremony, this exchange of gifts. I have never regretted having spoken the truth in my writing, and writing the truth in the privacy of my notebooks has been a rehearsal for every moment I’ve chosen to speak the truth in the moment to those concerned. When I do I become like the great poets, like Wang Wei, Li Bai, and Du Fu. Not as skilled as they were, but very much their younger brother. But of the four, I choose Bai Juyi as my guide, in writing and in life; a great poet who was until this morning unknown to me. May I write as if I will be an unknown even to those who consider themselves well read. May I write each line as if it will be the only one people will remember. May my grandest hope be that one line of my lines survives. The panda bear was originally a carnivore, but now solely eats bamboo. This is a negative evolutionary step, as pandas have retained a carnivore’s teeth, stomach, and intestines, and can get little sustenance from a bamboo-only diet. That is why whenever you a see a panda, they are either sleeping or eating. Both male and female pandas are territorial in the wild. This means that their contact with other pandas is unusual and very conflicted when it does occur. In addition, male and female pandas are very selective about whom they’ll breed with, and they might find no more than two or three eligible mates in a lifetime, whereas other species will at least meet dozens, if not thousands. 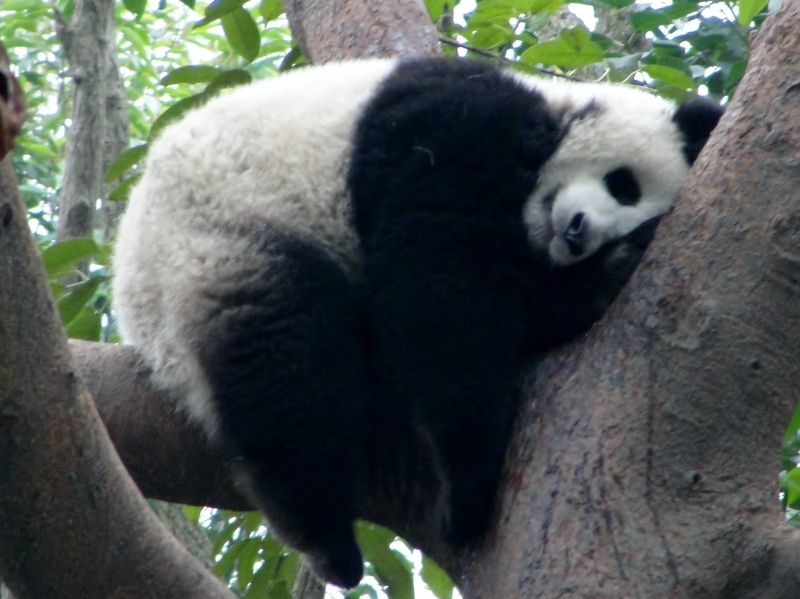 Pandas are extremely fearful and sensitive to changes in their environment, and have been retreating to remoter, less habitable wilderness following human encroachment on their habitat. 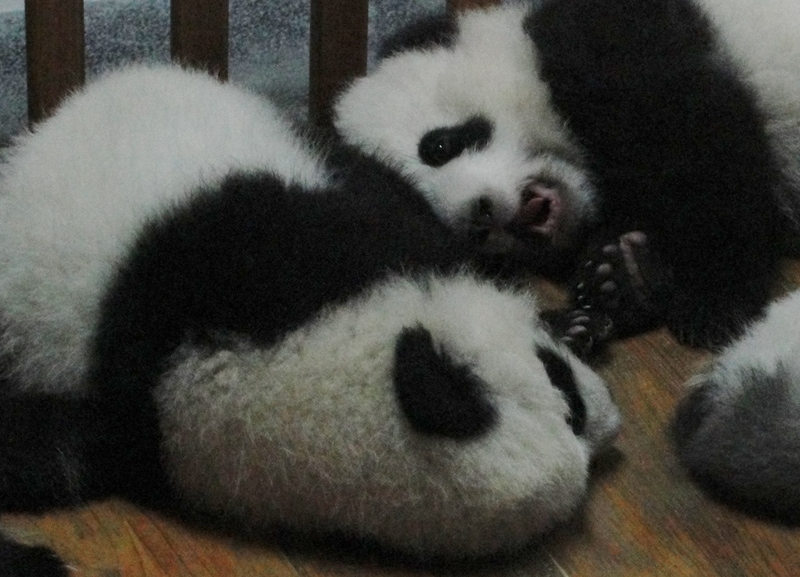 In addition, in 2008 an earthquake scared many pandas to death. And for some inexplicable reason—except that maybe God was sick of pandas and wanted them to die—the panda mother is one of the few animals who have almost no maternal instincts, and yet they give birth to baby pandas that are essentially nine-months premature, one of the few animals (along with humans) who need constant attention for over a year before they are capable of surviving on their own. Now that panda bears are an international symbol for China, there is a great desire to keep the panda bear alive, but things are not looking good. Without human intervention, pandas would already be extinct. What’s ironic is that what will probably kill them will be the other side of human intervention—the lowering air quality and the environmental disruptions due to an expanding population and climate change. There are even questions if the panda raised in captivity is really a panda bear at all. Tendzin—a native Tibetan, in his mid-thirties—tells us that in Tibetan “Lha” means God and “Sa” means Land. 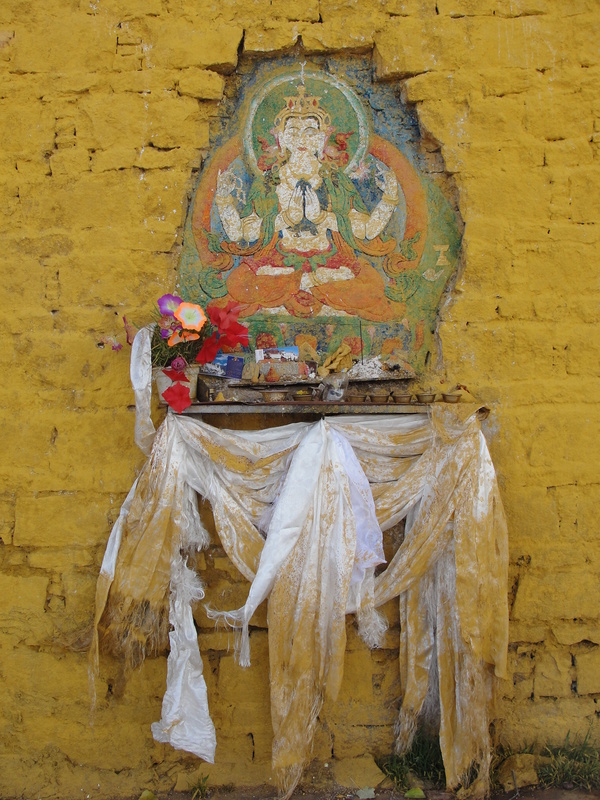 Bon is the original religion of Tibet. Bon is a form of animism, the first religion all over the world. Animists believe that every object is animated by its own particular spirit. A mountain has a spirit, and so does the clouds above it, and the sky, and the bus we’re driving in. A human is just another spirit and not always the most powerful one. Humans can destroy a forest, plunder a mountain, build structures against the weather, but lightning is stronger than a human. A wildfire, a flood, winter are stronger than a human. A rabbit is freer than a human. A human needs other humans and food and lodging to survive. A hawk can fly and so is more powerful than a human. Human life is long compared to a cloud’s or a butterfly’s, but short beside a pine, and insignificant beside a mountain. But of all possible lives, the human is the best. It is filled with experiences no mountain or tree will ever dream of, even though they see us come and go, come and go. To honor its spirit, we should begin our first morning with a kora around Potala Palace. 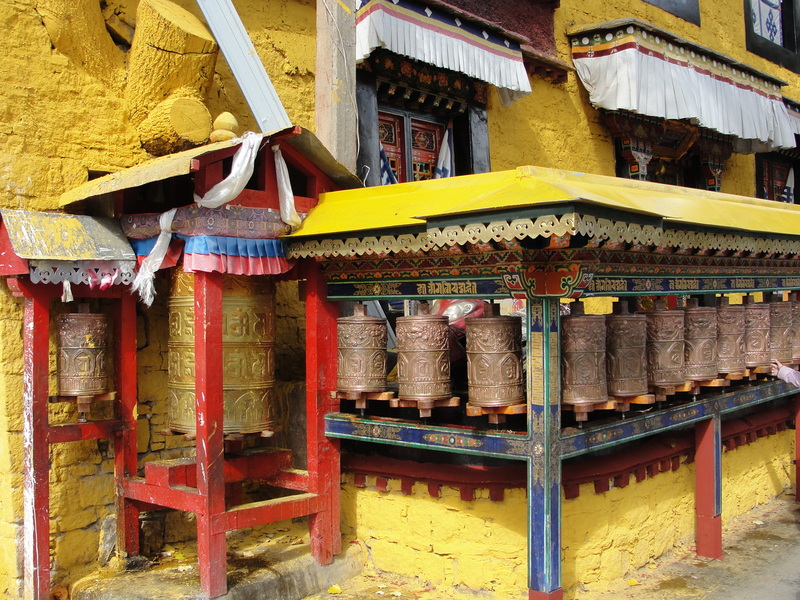 A kora is a pilgrimage, circling a holy site, in this case the ancestral home of the Dalai Lama, abandoned in 1959. 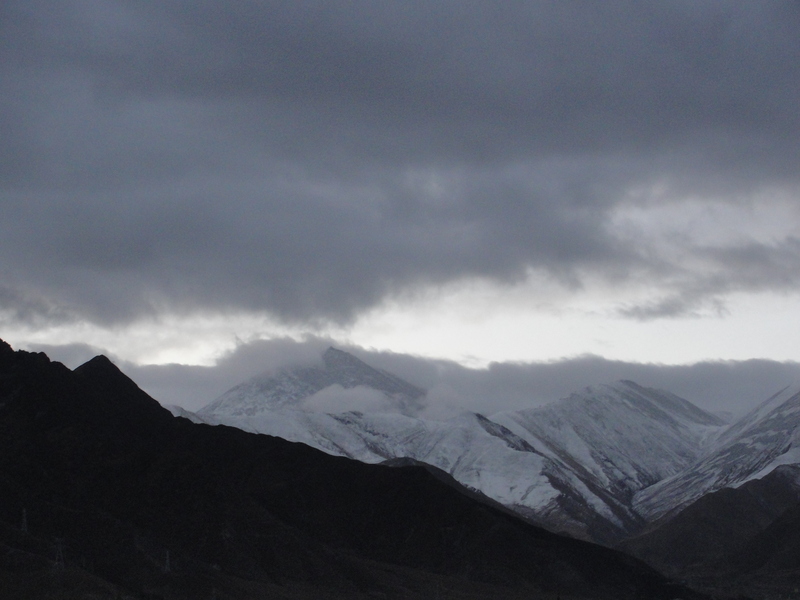 Then we follow Tendzin into the chilly, foggy, pale blue foothills above Lhasa. He keeps us entertained with a running commentary on all things Tibetan. “Excellent” in Tibetan is pronounced “yappa yappa dew.” It is acknowledged that this phrase is the root of the cartoon character Fred Flintstone’s expression for “excellent”—yabba dabba dew—but no one knows exactly how. The five colors of the Tibetan flag are of the five elements: red—fire; blue—sky; green—water; white—clouds, yellow—earth. These are also the five colors of the prayer flags and their order of appearance. No one eats fish in Tibet. A Buddhist will kill a yak that feeds many over a fish that feeds only one. The lowest elevation in Tibet is 9000 feet. 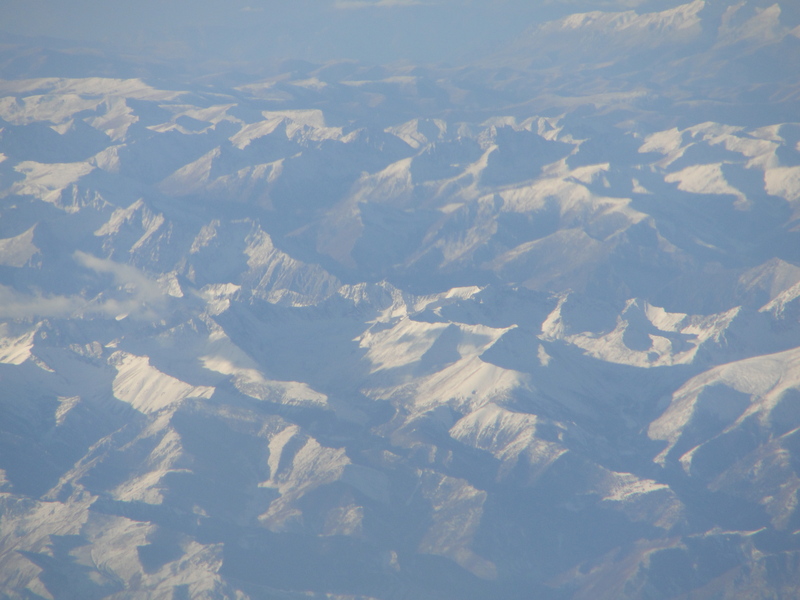 The mountains are green year-round in the Eastern province, but Tibet is known as the Land of Snows. Tibet still follows a lunar calendar but soon there will be no one who remembers life before the Chinese. In the streets there is a feeling that the disappearance is just beginning. thousands of eyes, flashing, shiny. In a bush beside the pond a yellow bird sings to a blue one on the other side. The blue one flies down and lands in the pond, ripples spreading out from under him, nonchalantly floating with his back to the yellow one. He splashes the water with his wings, bathing. The yellow one—I’m thinking it’s a female—floats down slowly—not in a hurry—and lands in the general area but facing away from the blue one, who immediately stops splashing but doesn’t turn around to look And they ignore each other in this way for a moment, neither of them singing. Then the yellow one turns toward the blue one and splashes water on his back. The blue bird splashes water on his own chest and sides, lifting his breast bone a few inches into the air, and then he turns around and splashes water on the yellow one, who turns away and dips her head and slaps the water with her wings, lifting her breast bone an inch or two above the surface of the pond. 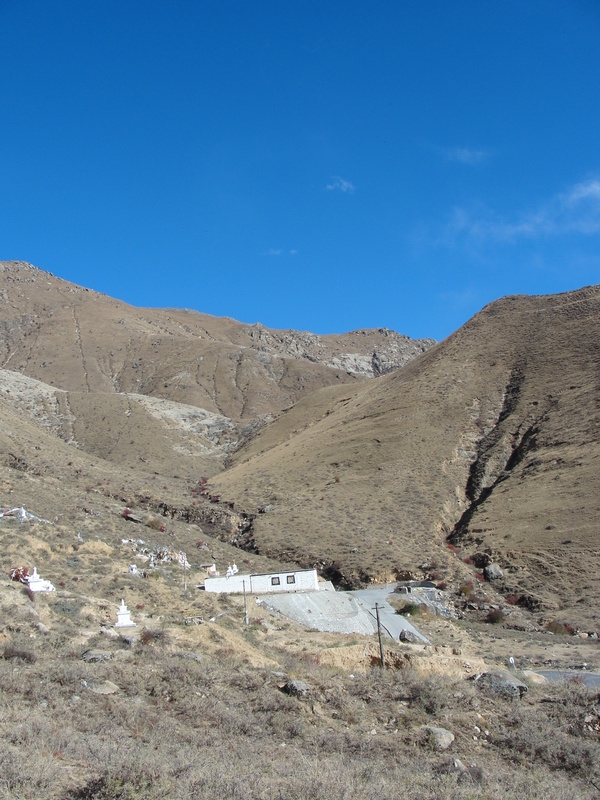 In the foothills above the Potala Palace, there is a concrete platform and a concrete storage shed leveled into a ridge, open to the sky. Out of reverence, we are asked to view it only from a distance. Our guide has been able to assist in two Sky Burials, where the deceased’s body is cut up and fed by hand to the vultures. The first time was more difficult than he imagined. He almost could not begin, and then had trouble continuing, and then he had trouble finishing. But the second time was easy. He knew what to expect and he also knew that one day his own body would be washed and fed to the vultures on this peak, and those attending may be attending their first Sky Burial and as scared as he was, or they could be more experienced like he was now, it wouldn’t really matter. And it was like he was cutting up his own body and feeding it to the vultures. If there is no high place for a Sky Burial, there is also a Water Burial, where the body is cut up and fed to the fish in moving water. For a child under ten, the Water Burial is practiced even in the mountains. Up until the 1959 crisis, every Tibetan family had to send at least one son to a monastery. This gave every family a personal stake in the spiritual and political bureaucracy of the country. Having a son serving in the monasteries, they were less likely to complain about abuses or corruption. This son’s main responsibility was to dedicate his life to praying to relieve his parents’ karma. And since every family needed only to reimburse the state for the cost of feeding and housing one son, this form of taxation wasn’t oppressive and it was applied equally to all and it guaranteed that the clergy would be self-sustaining in good times and bad. Tibet has a 4000-5000-year history. The first recorded Tibetan dynasty (meaning there are surviving documents as evidence) was its seventh. Tibet’s 33rd king unified Tibet into what is now known as the 1st kingdom. At this time, one of the king’s scholars was sent to India to learn Sanskrit and used Sanskrit letters to correspond to spoken Tibetan and created the Tibetan script. This 1st king of Tibet was a Bon, an animist—as was the entire country—but he married two women—a Hindu princess from India and a Nepalese princess who was a Buddhist. Soon the king’s religion of shamans and spirituals powers and rituals and sacrifices added ethics and Buddhist practices and some of Hindu’s more colorful gods. 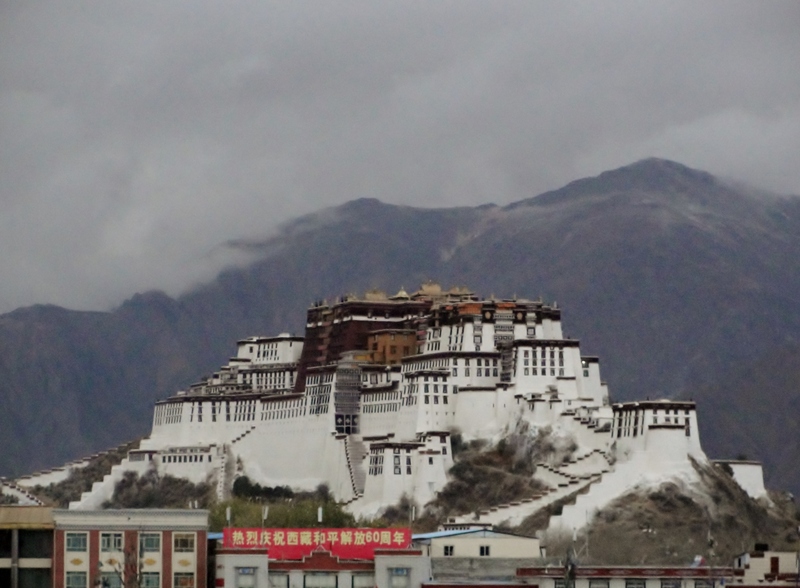 The expensive palaces and temples and monasteries in Tibet—like the Potala—are not Bon, but Buddhist. By the time of the 5th Dalai Lama—who built the first Potala Palace—the Buddhist lamas were Tibet’s sole religious and political leaders. Tibet’s political history has been turbulent. Various kings were killed, one by his own brother. For a while the Buddhists would be in power, and they would do what they could to eradicate the Bonists. Then the Bonists would overthrow the Buddhists and they would attempt to eradicate the Buddhists. Some of these dynasties lasted centuries and others lasted years. During this period the country declined until by the 9th century there was essentially no central Tibet. At best what used to be Tibet was now a decentralized group of independent city-states. That period lasted 400 years. In the 13th century, the country was reunified as part of the Mongolian empire. But the Tibetans were never ruled by the Mongols—who were essentially passing through Tibet on their way from Nepal to China—and cut a deal with the Buddhists. They installed a Dalai Lama as their proxy governor in Tibet. By the time that Dalai Lama died, the Mongols had forgotten all about Tibet, but the lineage of the monk-kings continued, right down to 1951. At the time of the reunification, Buddhism had split into many different sects in the separate city states, but every lineage came together in the 17th century under the current Dalai Lama. That period is known as the unification. A thing of beauty that disappears even as it comes into being. You have your whole lifetime to do something, and it’s not a lot of time. “In Tibet we have two names. One is our spiritual name. I would not give up my spiritual name for any reason.” Then he switches to a topic less sensitive: many Tibetans are named after the day they were born. For instance our driver’s name is Pen Be because he was born on a Tuesday. Our guide was ordained a monk in Dharamsala, but he had to return to Lhasa to care for his sick mother. If a monk is needed at home or finds the vows too difficult to keep, they are allowed to return to their families. But before he was allowed to re-enter the country, he had to spend six months in jail for overstaying his visa. Some times of the year are better than others for Tendzin. Right now is good, because there are a lot of Han holidays this season. Holidays are times that are celebrated by entire families, and none of the Han have family here, and the tour business is mostly left to the locals. There is a pause in the immolations; the border has been open for over two months. Things are safer. He and his family are eating well, and saving for the leaner days ahead. But there is no doubt in a year or two there will be no way to cut anything more from their budget. He will find one of the low-paying but steady jobs available to native Tibetans or his family will move or become beggars or starve to death. When I question if he is serious, Tendzin says that Chinese economic law sets the standard for how much a Tibetan should be paid less than a Han for doing the same job. For jobs that no Han will perform—like collecting garbage or being a butcher or working in a morgue—the bottom of the pay scale is next to nothing, and one person cannot live on it, much less a family. The Chinese will eventually win the attrition game, which may take no more than another generation. Many Tibetans die every day in the mountains. Not all of them are accidents, surely. When a Tibetan dies, his or her business license is given to a Han or priced above what a Tibetan can afford. Within a generation a Tibetan family’s ability to make money will be lost. The Tibetan language is no longer taught in schools, Chinese translations must appear alongside any written Tibetan. The children are taught from Chinese history books. Buddhism is allowed, but an army garrison is stationed in every monastery, and any monk who becomes too popular or outspoken will disappear into the prisons. Every pilgrim, often traveling by foot from the rural provinces, is easy to identify by their dress and the pilgrim’s satchel on their heads. 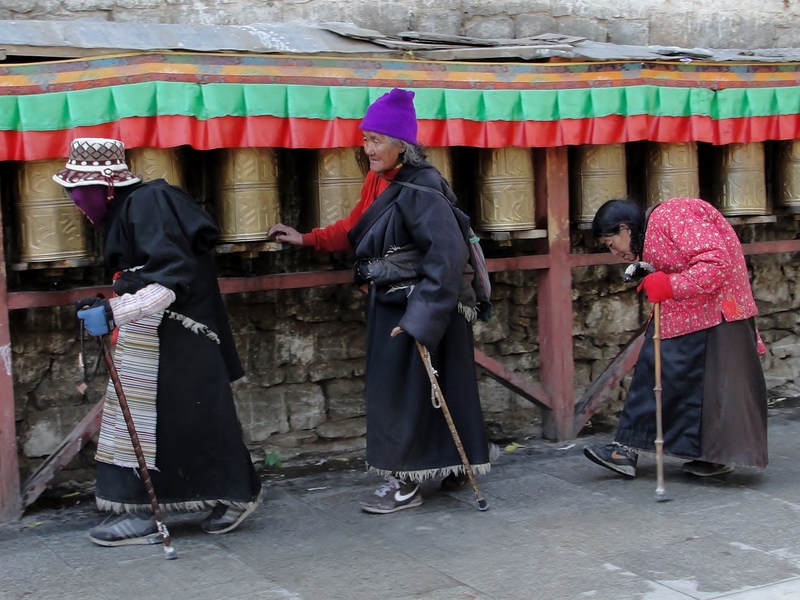 Although Tibetans are guaranteed freedom of movement in the country, the reality is that each pilgrim is stopped many times before they reach Lhasa. Any government official can demand to see their papers and then take several hours authenticating them. They can be ordered to submit to a body pat-down, and it’s considered shameful to be manhandled by a Han. 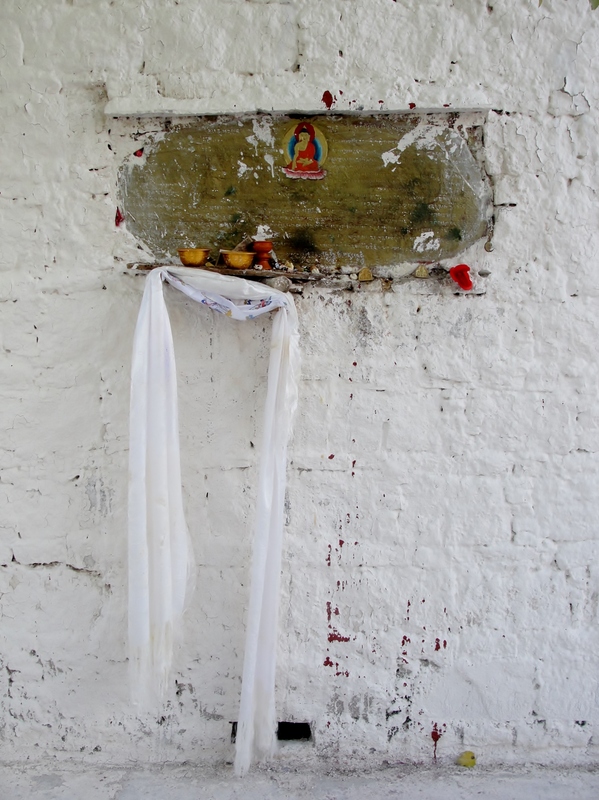 There are regular uprisings and regular repressions—especially in the East—but not in Lhasa. After the last uprising, the Chinese occupied Lhasa and they’re entrenched here now. The shrines are open and well-attended, but soldiers walk the streets with scary weapons. Lucite boxes were placed at every major intersection and they’re staffed around the clock by four Chinese soldiers, each facing different directions. These boxes can also essentially shut down these major intersections in the case of trouble. And when you look up outside the temples, you can see men with guns on the parapets surrounding the courtyard from above. Our organization, Tendzin tells us, is one of the few who insist on a local Tibetan guides. 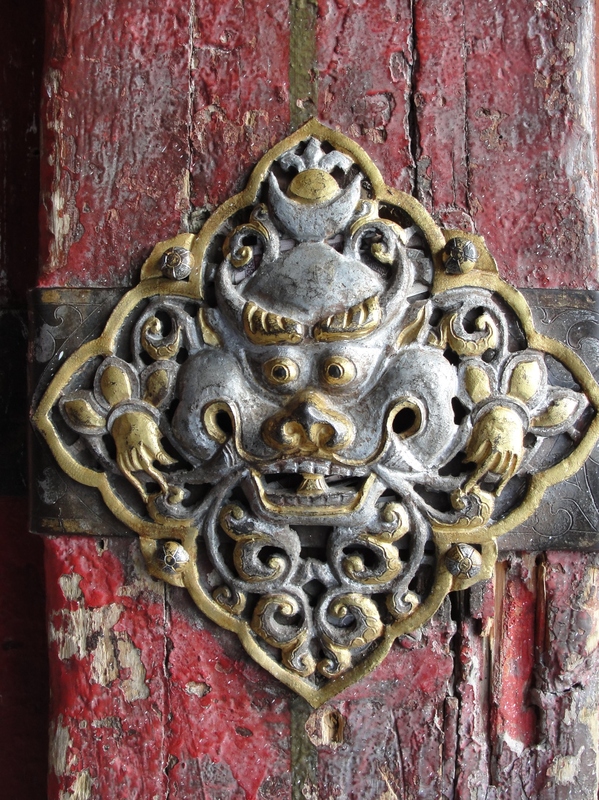 Most tourists could not tell the difference between a Han and a Tibetan, or doesn’t care. But our company insists that Xi—a Chinese national who believes that Tibet is and always has been a part of China—has to leave the bus so our guide can tell the Tibetan side of the story. On the drive back from dinner, Tendzin and I trade our favorite Buddha stories. He especially likes the one about how Buddha knew the pork he was about to eat was spoiled but he ate it anyway out of concern that he would insult the cook by refusing his gift. And when it was certain he would die, Buddha’s first thought was to bless the farmer, taking all harm from him and his ancestors for poisoning the Buddha, and declaring it a great honor to have served Buddha his last meal. He would like to have such composure in the face of death, Tendzin says. I was too tired for our nightly walk, and instead I lay on my bed and listened to the sounds outside my window, pretending they were music. Someone was hammering something on an anvil in a very definite rhythm: clang, clang, CLANG! In the pause that followed I imagined him examining his work, turning it over, looking up at passersby, taking a breath, waiting for the rhythm, then … clang, clang, CLANG! The conversations on the street were a mixture of Chinese and Tibetan. The human chorus rose and fell but there was a feeling that it was eternal, that it had gone on forever and would go on forever too. There was also the swishing, brushing sound of dry leaves against my window. 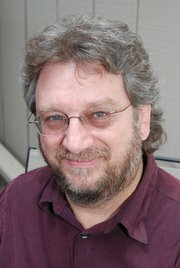 Motorcycles and scooters approached, and passed each other, and passed away, passing and passing each other. Surprises are only secrets because we can see only a tiny sliver, never the whole of anything. This time of year, the leaves are dry. In six months they will be green and scratching someone else’s window. And then other than natural law—where we say spring follows winter and autumn follows summer—even if we know anything, we cannot know more than what it has been, not with any certainty what it is about to become. And certainly not what will happen after that. Every piece of the whole whirling material universe is moving though time from no known source to an unknowable future, and even the great poet Bai Juyi did not know his true part in it. Aromatic incense rises into the sky to close the day. The birds are not singing. The sun drips below the clouds, and the grey haze fills with evening woodsmoke. At night the wind comes from all directions, most of it howling above the sky, strange and wild. It would be impossible to describe it without shouting.